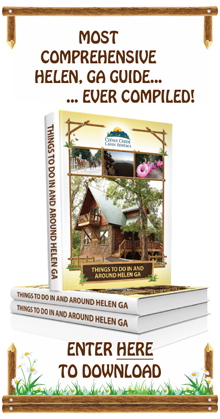 When you think about staying in Helen GA cabins, what comes to mind? Many folks picture a charming Alpine Village full of history and plenty of family-friendly activities. But just because Helen can provide these experiences for the tamer vacationers doesn't mean that there isn't plenty for adrenaline junkies to do in northern Georgia. If you're looking for the perfect place to enjoy extreme sports by day, while still being able to relax in luxury and comfort by night, it's time to book Helen GA cabins. Here's a look at a few of the many sporting activities available in the Helen area. When staying at cabin rental in Helen GA, many vacationers can't wait to get out on the water. One of the best ways to experience the Chattahoochee River is by stopping by Wildwood Outfitters where you can rent all of the gear that you need to spend a wet and wild day on the rapids. You'll start by speaking with one of Wildwood's expert staff who can set you up with the right trip experience, based upon your experience levels and thrill desires. 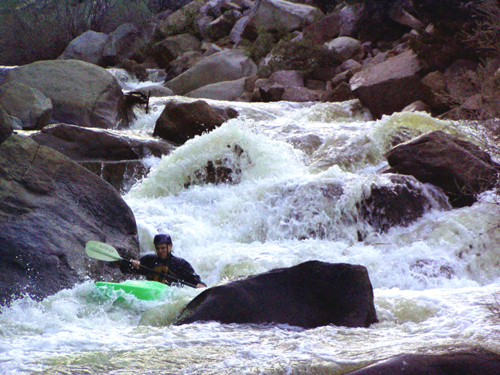 Section 4 - Located in the most remote section of the Chattahoochee River, the Section 4 trip accounts for the largest volume of water and is comprised of a dozen class 1 rapids. This is a great spot for beginners to the sport, and this area is also used during dryer times of the year when the water levels in the other sections are too low. Section 2 -The Section 2 excursion will take you up river to the Highway 255 bridge where you will be put on the water and quickly greeted by intervals of long Class I Rapids broken up by smoother pools. Halfway through the trip you'll be met with the Smith Island Rapids - the most challenging part of your journey. These class 2 rapids will raise your energy levels so that you can finish off the last mile of your excursion. Section 3 - The Section 3 trip begins up river at the Highway 115 bridge which is known as the whitewater section of the Chattahoochee. Almost right after you put in, your adrenaline will kick into gear as you experience a small drop below the bridge and soon enter the class 2-3 rapid zone. The most difficult aspect of this trip is referred to as the Three Ledges rapids. The first ledge of rapids is located on the left side before working you over to the second ledge on the right side of the river. The final ledge is located in the center of the water and includes a 2 foot drop. But the journey isn't over yet. After a small break of class 1 rapids, you'll approach Horseshoe Rapids which is made up of class 2-3 rapids. Embarking on a mountain bike adventure is another great idea if you're planning to visit a cabin in Helen GA. With over 60 bike trails in the north Georgia mountains, you'll never run out of options. You may opt to bring your own gear from home, but if that's too much baggage, you can always rent a bike from Woody's Mountain Bikes located right here in Helen. You can choose to go off on your own, or even head out on designated trail rides like the Gold Mine Ride and Woody's most popular package - the Gap Ride. 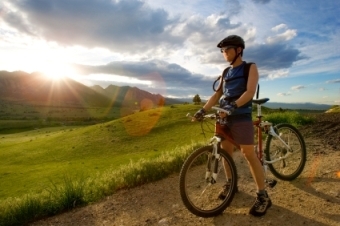 On this trip, you'll be fitted with your perfect mountain bike and helmet. After being shuttled up a mountain, you and your group will be dropped off with a map and will be able to ride back to Woody's on a self-guided tour through the scenic woods at your own pace. The excursion features 14 miles of hills, waterfalls, forest scenery, and more. You can stop to check out the sights along your ride, enjoy a picnic lunch, or just power through the fourteen miles to feel the burn. When you're done, you can head back to your cabin in Helen GA to give your muscles some much needed rest in your private hot tub or Jacuzzi bath. If you love the feeling of being on top of the world, mountain climbing may be your best bet. Many of the state parks surrounding your cabin in Helen GA allow seasoned mountain climbers to challenge themselves and get their heart's racing. But if you're new to the sport or are just curious, you may want to take a day trip to Atlanta and sign up for a mountain climbing class at Atlanta Rocks! indoor rock climbing center. The experts will show you the ropes and teach you how to climb smart and climb safe. Are you ready to get extreme during your stay at a cabin in Helen GA?